Hi peoples!!! How are you? Good. Cause I wanted to know. So if you have never listened to one of Ed Sheeran's songs then shame on you, your family, your family's goat, and your goat's family. Cause you be missing out on everything beautiful, wonderful, and sad. He has a wide variety of sad, dancing, happy, and lovey dovey songs. Ok, I'm done with my sassiness...For now. His dancing songs. Now most of the dancing songs has rapping in it and I'm normally not the one for rapping but when he does it it's amazing but everything he does is amazing. I may think I dance like this when I listen to the dancing songs. But in reality I'm dancing like this. His happy songs. He doesn't have many happy songs but when he does have them they are awesome. His lovey dovey songs. I was soooo excited to get to these because I LOVE them they are soooo sweet and soooo pretty. 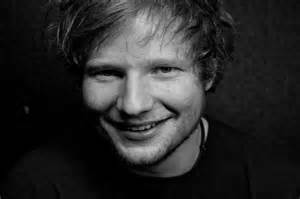 Especially Thinking Out Loud, Oh my gosh that song it's so beautiful. I'm seriously so in love with it. You know I just realized that you don't realize how much love something until you write it down... Yeah that just happened to me. Oh and here is a picture of the ginger himself.